Learn how to make authentic Genovese Pesto with Dino Joannides recipe and traditional method using a pestle and mortar. 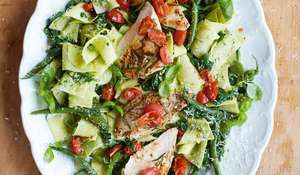 Serve with a steaming bowl of pasta. The word pesto comes from pestare, which means 'to pound or crush', and gives a big hint as to how the sauce should be prepared. 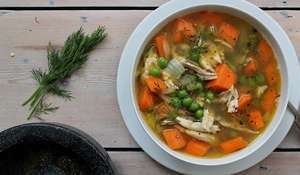 As for the derivation of the dish, ancient Romans ate a paste of crushed garlic, cheese and herbs called moretum, and one variant included pine nuts, but the proportion of cheese seems to have been much higher than that of the herbs, so it was rather less of a herb sauce than pesto proper. The first mention of a recipe for pesto as it is known today was in the book La Cuciniera Genoese (The Cooking of Genoa), written in 1863 by Giovanni Battista Ratto. A little over a decade later the definition of 'pesto' in the Genose Italian dictionary by Giovanni Cassacia said it was autochthonous with the city (i.e. originated in Genoa). There is also a possible link between pesto and agliata, a paste made from walnuts and garlic, which was very popular with Ligurian seafarers. 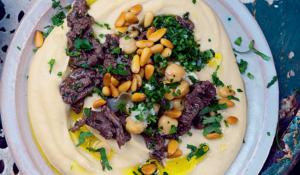 This would also link it with one version of the French garlic sauce aillade (the other being closer to aioli) and perhaps even to the Greek skordalia. 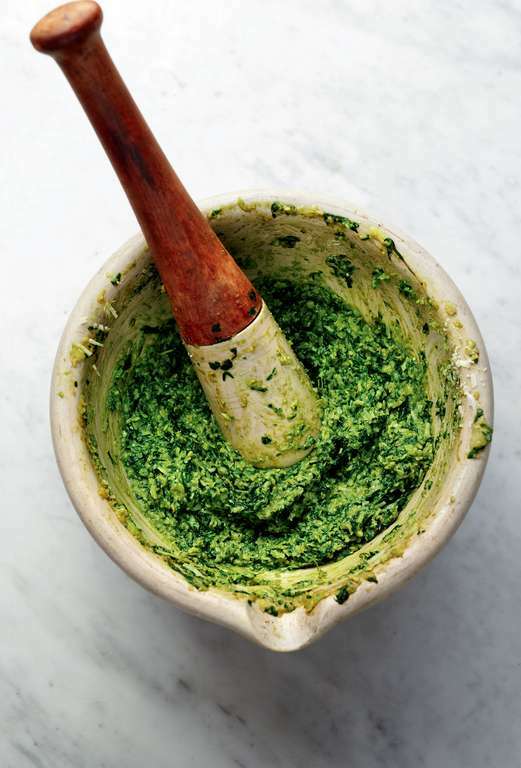 Making pesto properly is another good case for slow food because it should ideally be made shortly before it is eaten. 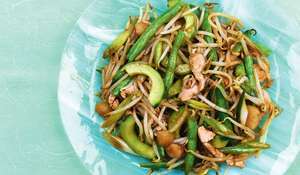 It is also one of the many recipes where you need to be very flexible in terms of quantities; tasting and adjusting them during preparation is a must. The quantities in the recipe are just a guideline, and you will have to adjust them based on how the ingredients interact during the pounding process. 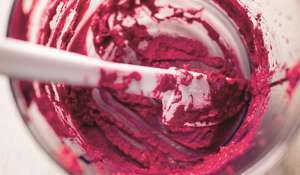 To my mind there is no substitute for pounding by hand, and I recommend using a marble pestle and mortar, though some prefer to use a wooden pestle and marble mortar. Pesto made in a food processor tends to require extra olive oil and in my view, the machine is too harsh on the ingredients, making both the texture and flavour somewhat insipid. The recipe given here is not the only way to make pesto. In fact, around Genoa and all over Liguria each person has a secret recipe: you will never find two versions of pesto that are exactly the same. 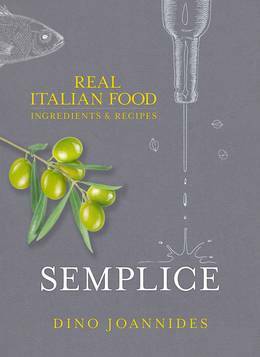 The main variables tend to be the choice of oil and pecorino, and whether or not to include Parmigiano Reggiano. Pesto is normally served with pasta, to which some people add a few cooked green beans (boiled with the pasta) and/or potatoes. I must admit, I have never liked the combination of pasta and potatoes - I find it too heavy. 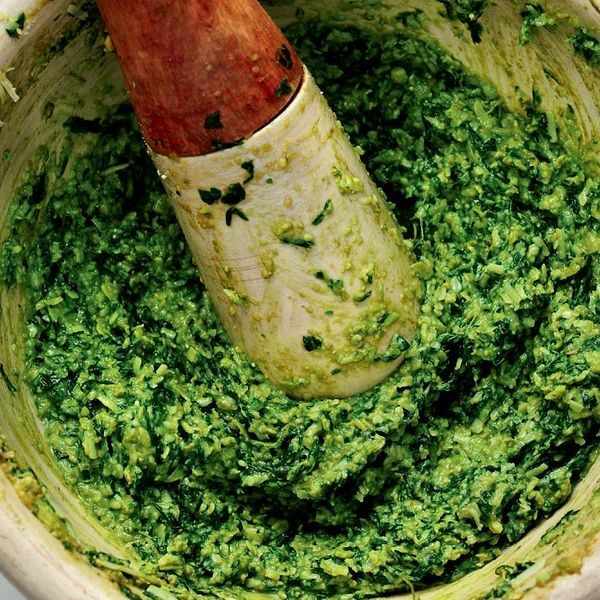 The most common way to eat pesto alla Genovese is with trenette or trofie as a first course. It is also delicious with gnocchi, and I remember having gnocchi with pistou (the French version of pesto) served as a side dish with a Provencal beef doube (stew) in La Merenda, one of my favourite restaurants in Nice. Run by Dominique Le Stanc, who abandoned his Michelin-starred restaurant at the Negresco hotel to cook simple regional food, this small restaurant has no telephone but is always busy. 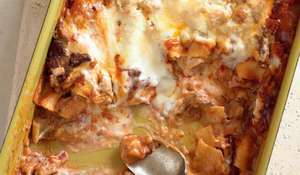 A lot of dishes are typical of what one finds on both sides of the border between France and Italy. Finally, pesto can also be served as a condiment with cooked meats and fish and used on tomatoes instead of fresh basil. Wash the basil leaves in cold water and dry them on a tea towel but without rubbing. The following steps must be done as quickly as possible to avoid oxidation. Put the garlic and pine nuts in a mortar and pount with the pestle until smooth. Add a few grains of the salt and some of the basil leaves, then pount the mixture, using a light circular movement of the pestle against the sides of the mortar. Repeat this process until all the basil has been pounded. When the basil drips bright green liquid, add both cheeses and mix well. Pour a thin layer of oil over the pesto and mix very lightly. You can store your pesto in an airtigh container in the fridge for a couple of days, but it will never be as good as freshly made.